Like so many soaring pilots in their youth, Paul Tuntland as a teenager in the 1930s, was flying model gliders on an "old dusty dirt road" in Baldwin Park, California, a suburb of Los Angeles. He and Ed Minghelli, who was to become a well-known world-record-setting pilot, watched their gliders soar out of sight and wondered if someday they too might be able to soar. They began to create their dream by building a Bowlus Baby Albatross and organizing a club that eventually became the San Gabriel Valley Soaring Group. As World War II arrived and based on his Albatross soaring experience, Tuntland, at age 19, was appointed as a civilian glider instructor for the military with the Twentynine Palms Air Academy. 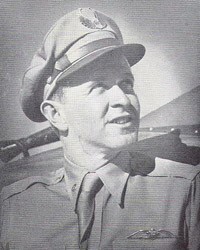 When the glider program ended, he was one of the few selected to instruct in airplanes for the Army in the desert area north of Los Angeles. Post-war, Tuntland worked with Dr. Gus Raspet on the Thunderstorm Project in Florida. To quote Dr. Raspet: "Paul was the first pilot barring none to enter the thunderstorm with the express aim of collecting scientific information. Paul entered these violent and powerful atmospheric disturbances with a cool consideration with absolutely no trace of flamboyant glamor." Since he considered himself a loyal Californian, Tuntland had decided California had better climate and oranges, as well as thermals, than could be found in Florida. Regarding that belief, he now said, "I take it all back even though it means I may be excommunicated from the Loyal Californians." Tuntland worked closely with Dr. Raspet on the Ridge Flow Project. To quote Dr. Raspet again, "Because of his concentration on improving his work and on bringing down a maximum of information for the scientists, (Paul) had built an enviable reputation for himself and for the scientific phases of motorless flight." Among his more glamorous flying was his participation as a stunt pilot in the filming of the 1946 film Gallant Journey, an historical film starring Glenn Ford about the efforts of early aviation pioneer John J. Montgomery to build and fly a glider. Tuntland flew replicas of the three main types of Montgomery gliders. Tuntland's chosen post-war professional career was as a pilot for Trans-World Airways and later Western Air. His thirst for information about the atmosphere and the movement of air led him to record data which indicated the possibility of an as yet mysterious "jet stream" even while flying a Constellation airliner over Ohio to prove the probability in that area under particular weather conditions. Because of his experience and skill, Tuntland was selected to be chief pilot for the historic Sierra Wave Project. But it was not to be. On September 9, 1950, Paul Tuntland in the Prue 215 and Bill Ivans in the 1-23 were towed aloft by Gus Briegleb to a weak thermal south of El Mirage. Tuntland planned some stability tests and he was spotted at 8,600 feet flying towards the east in very smooth air which is required for data collection. After Tuntland had been in the air about 2 3/4 hours, the Prue 215 was seen diving towards the earth, spinning rapidly with the right wing gone. A chute appeared at approximately 250 feet above ground -- much too late. The pilot died instantly upon impact holding his rip chord in his hand but with "the Tuntland smile still on his face." The Paul E. Tuntland Award was established in Paul's honor in 1952 and may be awarded to a person who, during the preceding year, made a flight resulting in advancing the science of soaring flight as reported in a published paper or article describing the soaring flight and resultant contributions. Tuntland had earned Silver #45 in 1943 and Gold #9 in 1947. He was awarded the Eaton Trophy in 1947.